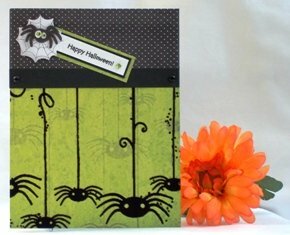 Try a Halloween card idea with a spider theme for Halloween card designs. 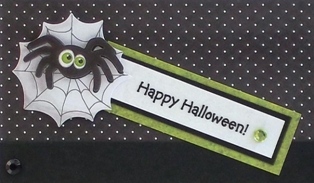 Homemade card ideas to make Halloween cards can include spider stickers too. I found a pack of Halloween stickers and I knew they'd be great for my handmade card ideas. Aside from pumpkin and ghost shapes, it included spiders so I decided to use one of the spiders for my homemade Halloween cards. The web made up the background of the sticker and the spider had foam tape so it made the sticker dimensional. For your paper card making ideas, use colors from stickers to coordinate the colors for your card. Since the spider had green eyes, I decided to use a green print to make a Halloween card. 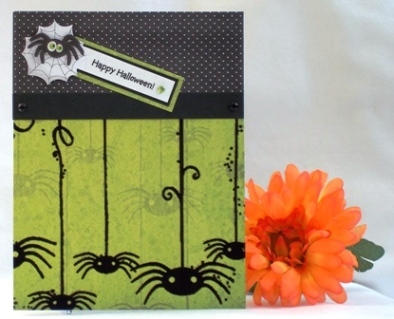 One of my paper stacks had a border design with spiders so I thought it would be great for making Halloween cards. I decided to use it for the bottom of my handmade card making project. 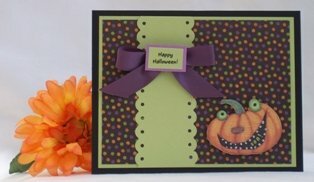 To build your own Halloween cards, use black polka dot paper since it coordinates with most colors and paper. For the top portion of my Halloween greeting card, I used black paper that had white pin dots. I divided both green and polka dot paper with a solid black strip. For my handmade Halloween cards, I printed the sentiment on my laser printer. Once the sentiment was printed out, I placed it on black paper and then used a small green portion of the spider print to make the green border. 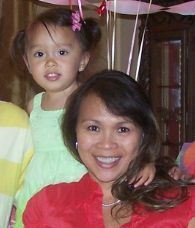 Accents for homemade greeting card ideas can be stickers, ribbon, brads or gems. Since the green spider pattern paper was so busy, I decided not to use a lot of embellishments on my Halloween card craft. I adhered a green gem on the sentiment and two black gems on the black strip of paper. 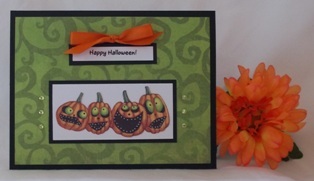 For your Halloween cardmaking ideas, try these ideas to build your own Halloween card. I utilized stickers from a pack for these Halloween cards. 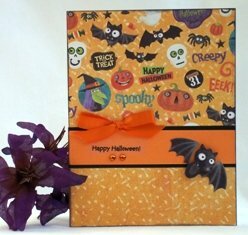 For this happy Halloween card, I used a Halloween paper stack that had coorinating pattern paper. I used a busy print on the top of the card and a print that wasn't as busy on the bottom of the card. The solid orange paper helped divide the prints. 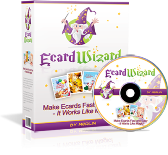 The design idea came from an ebook 50 Card Making Sketches. 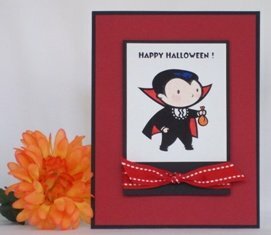 To use die-cuts for your Halloween greeting cards, place it on a white background and then place it on a black piece of paper so the black paper creates a border like I did with the card below. 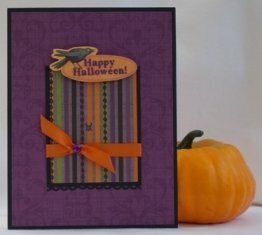 Here is another Halloween card idea using a pumpkin die-cut. I used an ebook called 50 Card Making Sketches to help me design unique Halloween cards.